Jawaharlal Nehru Medical College. Founded 1990 at Wardha, Maharashtra. Affiliated to Datta Meghe Instt. of Medical Sciences (Univ. ), Nagpur. UG / PG Course. Jawaharlal Nehru Medical College. MBBS 150 Seats. PG 112 Seats. The medical college is having a deemed status as per the UGC Act 1956. The affiliated university is Datta Meghe Institute of Medical Sciences (Univ. ), Nagpur. The medical institution conducts an all India Entrance Examination to select students into UG / PG courses. MBBS, MD, MS, MCh & Diploma Courses – The UG course is MBBS. The PG courses are in MD, MS & MCh. All of these UG / PG Courses in Jawaharlal Nehru Medical College, Sawangi (Meghe), Wardha, Maharashtra are recognized by Medical Council of India. Admission in MBBS Course – For getting admission into MBBS course in Jawaharlal Nehru Medical College, Sawangi (Meghe), Wardha, Maharashtra the students have to qualify Common Entrance Test conducted by Datta Meghe Institute of Medical Sciences (Univ. ), Nagpur. The selection of the students is done based on the ranks obtained in the all India Entrance Examination. Brief details about Jawaharlal Nehru Medical College, Sawangi (Meghe), Wardha, Maharashtra –The brief details of the medical college are given below for the aspirants looking for admission in the Medical College. The details include contact details, facilities, year of establishment, recognition, accreditation, etc. Address Sawangi (Meghe), Wardha- 442005, Maharashtra, India. MBBS 150 Seats – All India Entrance examination conducted by Datta Meghe Institute of Medical Sciences (Univ. ), Nagpur. PG 112 Seats – All India Entrance examination conducted by Datta Meghe Institute of Medical Sciences (Univ. ), Nagpur. PG Specializations of 32 different courses for 112 seats are available in Jawaharlal Nehru Medical College, Sawangi (Meghe), Wardha, Maharashtra. Admissions are based on the competitive entrance examination conducted autonomously by Datta Meghe Institute of Medical Sciences (Univ. ), Nagpur. Admission in PG Course – For getting admission into MD, MS and MCh Courses in the medical institution, the MBBS graduates have to qualify Common Entrance Test – conducted by Datta Meghe Institute of Medical Sciences (Univ. ), Nagpur. The College campus is situated about 2 kms from the Wardha Railway Station and about 7 kms from Sevagram Railway Station. 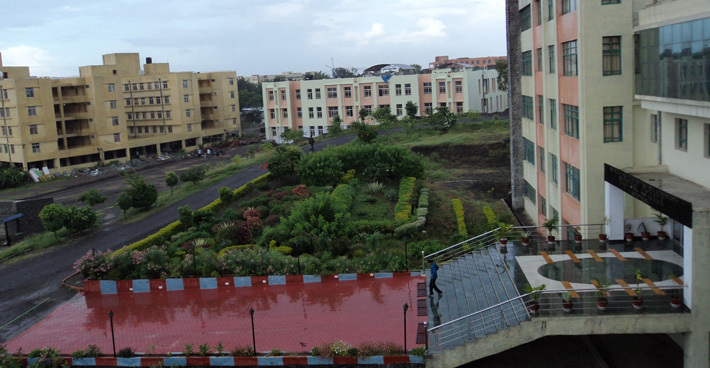 The Jawaharlal Nehru Medical College(JNMC), Wardha was established in 1990. JNMC is a constituent part of Datta Meghe Institute of Medical Sciences University, Nagpur. The College is affiliated to Nagpur University, and approved by Medical council of India, New Delhi. DattaMeghe Institute of Medical Sciences is a Public Trust registered under Bombay Public Trust Act, 1950. It was previously known asSmt.RadhikabaiMeghe Memorial Medical Trust. Datta Meghe Institute of Medical Sciences, a Deemed University was granted this status by the University Grants Commission in 2005. It hasbeenreaccredited with the Grade A grade by the National Assessment and Accreditation Council (NAAC) for a period of five years in March 2013. Thereafter, it was included in the elite Category A by the MinistryofHRD, Government of India amongst the Deemed Universities in the month of May 2013. The University is also the recipient of the Dr. B.C. Roy Award for Research. Dr.Dilip Gode, aneminentLaprascopic surgeon is the current Vice-Chancellor of the University.The constituents of the Deemed University are located in a 125 acre campusinSawangi (Meghe),Wardha about80kms from Nagpur, Maharashtra, India which is the geographic centre of India. It is located away from the hustle and bustle of the city amidst serene surroundings inaself sustaining complex with an excellent academic ambience. It isverywell connected by road, rail and air (via Nagpur) to all the major cities in the country. Nagpur has now become an international airport with direct flightsfromSharjah and many more on the anvil in the near future.The constituents ofDattaMeghe Institute of Medical Sciences (Deemed University) are subdivided under five Faculties: –I. FACULTY OF MEDICAL SCIENCESConstituent College :JAWAHARLAL NEHRU MEDICAL COLLEGEEstablished in 1990, it is now among the best private medical colleges in the country. It also has the intake capacity of 200 students annually. Since its inception, it has grown by leaps and bounds thereby earning fame and recognition. It is recognised by the Medical Council of India, the World Health Organisation, the Sri Lanka Medical Council and also by the Maldives Quality Authority. It has recently been notified by the Medical Council of India as one of the4Â Nodal Centers in the country for the National Faculty Development Programme for the advanced training in the area of Medical education to the faculty of 15 medical colleges in the region.The University has been included in the prestigious NMEICT project to the Ministry of HRD, Government of India and Internet connectivity of 1 Gbps has been provided.Courses offered: M.B.B.S, B. Sc DMLT, M.D., M.S., Master in Public Health, Master in Hospital Administration & Management, M.Phil in Medical Education, M.Ch Cardiothoracic Surgery and M.Ch Cardiac Anaesthesia,PhDACHARYA VINOBA BHAVE RURAL HOSPITAL (AVBRH)Is a 1,208 bedded fully equipped teaching Hospital attached to the Medical College with state of the art facilities. It motto is â€œ Cure with Careâ€ and it is certainly living upto the same with the help of its dedicated team of highly qualified, skilled and experienced doctors and technicians. Inspite of it being located away from a major city, it offers super specialty treatment in the form of advanced surgeries such as Cardiac surgeries (First in the entire district), Renal Transplant (only Private Medical College Hospital in Central India), Joint replacement, Corneal transplant, Endoscopies and Laparoscopic surgeries, Neuro and Spinal surgeries, Maxillofacial and Plastic surgeries as well as Oncosurgery to name a few. It is backed by the latest medical, imaging and diagnostic equipment such as Colour Doppler, CT Scan, High precision monitors, which are upgraded periodically to keep pace with the latest advancements in the filed of Medicine. It is also equipped with an ultra modern Operation Theatre Complex with attached ICU, ICCU, Surgical ICU, Pediatric ICU and Neonatal ICUs having all the necessary equipments such as Multipara monitors, Central Monitoring System, Ventilators for providing the best possible treatment to the patient and also give the best environment to the aspiring doctors to excel in their field. Due to its expertise, this Hospital has gained lot of goodwill and has also earned the trust of the local populace which is reflected in the number of patients in the OPD and IPD. This showcases the talent and expertise of this Deemed University. This comprehensive tertiary level Hospital is fast developing into a Referral Centre of Central India. It is the only hospital in the district licensed to carry out Renal Transplants and the fully equipped Cardiac centre was also inaugurated in April 2010 which is also the only one in the District. Are you looking to get immediate 2018 mbbs entrance in Datta Meghe Institute of Medical Sciences Wardha through management quota? Then you are at right website, our well knowledgeable councilor will present each detail about the entrance process which can help you to preserve your seat in this college. Datta Meghe MEDICAL COLLEGE, Wardha. Admission 2018 In Dr.Datta Meghe Medical College Wardha (Nagpur). Get admission details , fee structure details for Datta Meghe Medical College Nagpur (Savangi, Wardha) from one of the BEST MBBS enquiry. We are educational enquiry providing admissions guidance in TOP MEDICAL COLLEGES Maharashtra.